from wwenzz, posted april 12, 2007. Alex's case is featured in today's Straits Times, Home section, page 2. He's currently fighting strong in TTSH's icu and his family is appealing for more witnesses, especially the cabby's passenger. 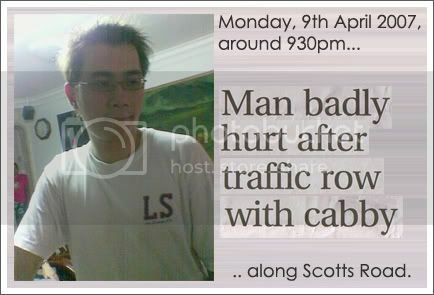 If you saw the incident, please stand forward and drop us an email at welovealexlim@gmail.com. If you didn't, you can still help by pasting this notice on your journal and spread the words. Your kind help will be deeply appreciated. Meanwhile, do keep him in your prayers or thoughts. Thank you so much for taking your time off to read this. Lets hope Alex will pull through this tough time and the witnesses will be found soon. wow. i'm just shocked. without words. i see it as murder or manslaughter as opposed to a rash act. but that's just my not so humble opinion. He should be charged with grievous bodily harm if he hasn't been already. Hope the eyewitness comes forward and that Alex improves. Told the man on the phone earlier, and he was glad the driver was caught because he's a disgrace to all decent cabbies. i'm sure there are good, kind cabbies out there. :) it's just the rotten apples surfacing lately. I am shocked that a human being can simply watch another die before his eyes.. Boycotting comfort cabs till this is resolved. I don't care if this means waking earlier to make the mad rush for the bus. apparently many cabbies in singapore really need their anger management classes (and those who are doing that are not learning much anyway).